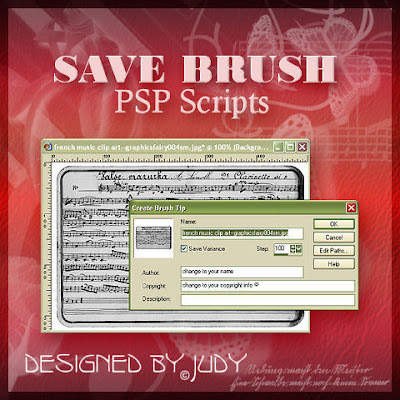 Many lovely and useful brushes are available as Photoshop brushes. These I convert to .png files using ABR Viewer or abrMate . Invariably the brushes come in sets and the time taken to resize for use in Paint Shop Pro. and save using their original file name can be daunting. To speed up the process I have written these scripts which enables quick resizing and save the file name as well as allowing the user to change file paths as needed. Their are 2 scripts in the zip, One for versions 9 to X and the other for X1 and above. Both or either should be placed in your Scripts trusted folder. Thank you so much for this post. I want to let you know that I posted a link to your blog in CBH Digital Scrapbooking Freebies, under the Page 2 post on Dec. 16, 2011. Thanks again. Thank you so much for this lovely freebie! I will sure use it in the future.